International news organization focused on supporting young journalists as they tell the defining stories of their generation. Alice Cherry, a second-year law student, stands outside Harvard University's Massachusetts Hall to hand out pins and brochures about the campaign to push Harvard to divest from fossil fuels. CAMBRIDGE, Mass. -- On one side of this academic mecca, renowned climatologist James Hansen explained some of the incoming perils of climate change at the Massachusetts Institute of Technology last week. On the other side of town, students and faculty at Harvard University continued a "Heat Week" sit-in outside the campus's main administrative building, calling for the university to divest its endowment from corporations associated with fossil fuels. Earlier this year, Harvard increased its investment in fossil fuels from $11.8 million to about $79.5 million. A large chunk of this, $57.4 million, was invested in Anadarko Petroleum, one of the companies involved in the Deepwater Horizon oil spill. Several other companies Harvard invests in are involved in hydraulic fracturing, or fracking. Harvard's continued financial support of the fossil fuel industry comes despite a referendum in 2012 that shows 72 percent of Harvard students favor divestment. At two of the world's most influential universities, the focus on global warming at both an establishment and grassroots level could signal a renewed push among academic circles to force action on climate change. "The IPCC [Intergovernmental Panel on Climate Change] says by the beginning of the next century, 25 to 50 percent of species on earth will be extinct, if business continues as usual," said Hansen at MIT, adding that even if global temperatures rise by only 2 degrees Celsius, a commonly cited goal to avoid the most devastating potential effects of global warming, it would still cause an emergency. "There would be a sea-level rise of several meters, meaning coastal cities would be virtually destroyed." If anyone embodies the marriage of academia and civil disobedience, it's Hansen. In 1988, he became one of the first scientists to testify to the US Congress on the link between pollution and a heating planet. And from 1981 to 2013, he worked for the NASA Goddard Institute for Space Studies in New York City. But in the 2000s, his approach became more confrontational. Hansen appeared in a 60 Minutes episode in 2006 saying George Bush's administration had watered down press releases on climate change by federal agencies, making them seem less perilous. In 2009, he was arrested protesting mountaintop removal mining in West Virginia. He was then arrested in 2011 and again 2013 in front of the White House protesting the Keystone XL pipeline. Such determination can be felt on Harvard's campus, where demonstrators risked arrest for blocking entrances to Massachusetts Hall, the campus's oldest building, forcing administrators to work elsewhere. Campus police have refrained from taking any action on the crowd, though, and interactions have been amicable. 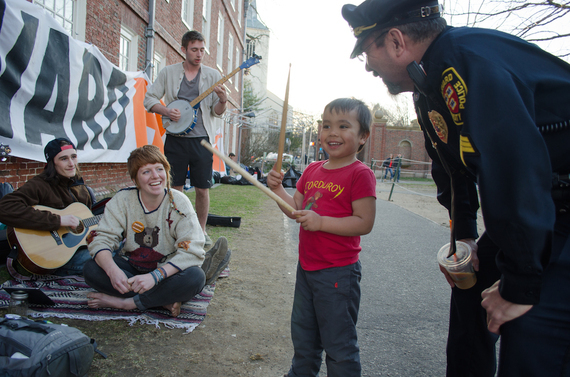 Students play music and laugh with a young boy and a Harvard Univesity police officer. "Fossil fuels corporations spend so much money lobbying Congress, funding climate deniers, and defaming research ... so a lot of the responsibility comes down on those corporations," said Naima Drecker-Waxman, a Harvard freshman at the protest. "That's why we want to rebrand and politically bankrupt them and retake our democracy." The problem of money in politics is echoed by Hansen, who calls it one of the principle hindrances to enacting effective public policy to protect the environment. At the event, Hansen stood tall with scanning green-blue eyes and occasionally let a slow smile cross his face. Now in his mid-70s, he did not have on his Indiana Jones-like brown safari hat that has become a personal trademark. While speaking and reaching down to change slides on his laptop, he voiced a patient, sarcastic sense of humor. At one point, after describing some of the environmental crises ahead, he paused and said, "So there are some incentives to figuring out this problem." The crowd of mostly professors and students laughed accordingly. Hansen began his career by studying the atmosphere of Venus, but switched to Earth when he realized that "a planet with a changing atmosphere and consequences for billions of people is far more interesting." He now heads Columbia University's Department of Climate Science, Awareness and Solutions. At MIT, Hansen spoke about how America's East Coast experienced anomalous cold weather this winter, but that the year overall could still be among the hottest on record. His most immediate warning, though, was the dangerous disjunction between science and policy. A recent analysis by the Center for American Progress found that over 56 percent of Republicans deny or question the science behind human-induced climate change. With such a sizable minority opposing meaningful legislation to curb carbon emissions, Washington has failed to act in the timeframe needed to address the crisis. Many congressmen and women who deny global warming receive campaign contributions from oil companies. 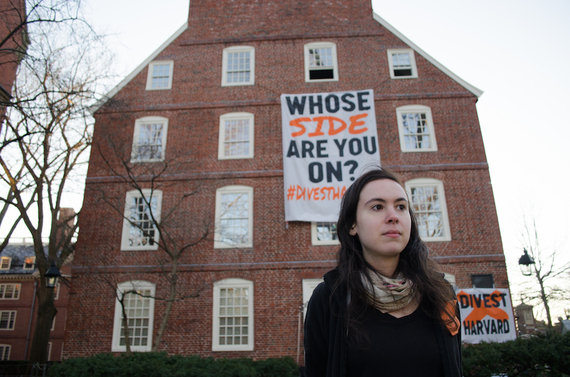 For both Hansen and divestment protesters at Harvard, activism is a crucial conduit to breaking through political and institutional paralysis. Already, many institutions and universities around the world have announced plans to divest. "It sends a message that the business model of the fossil fuel industry is so destructive that we can't engage with them anymore, and that we need to demand that our political leaders don't engage with them either," said Sidni Frederick, a sophomore who studies history and literature. "It's part of a larger movement against thinking that reckless, unaccountable profit seeking is okay."